When we were planning a road trip across Morocco, it was very hard to decide which road to take and how should our travel plan look like. It was changing almost every day. Below you can find a map of the roads we decided on at the end. Made approx. 1600 km, spent over 27h in a car and we did it all in 5 days. This is our road itinerary. Taking a road trip in Morocco is a must if you ask me. Visiting only big and popular cities will not give you the full idea about this country. First day of our trip started very relaxed, by that I mean it took us only 3h and 30 minutes to reach our first bigger stop, city named Ait Benhaddou. Each and every next day of our trip was becoming more and more advanced and we’ve gotten more and more ideas, what else we should visit and the (almost) very last day we made 9h long drive and approx. 550km. The ksar, a group of earthen buildings surrounded by high walls, is a traditional pre-Saharan habitat. The houses crowd together within the defensive walls, which are reinforced by corner towers. Ait-Ben-Haddou, in Ouarzazate province, is a striking example of the architecture of southern Morocco. This is a traditional Mud Brick city on the edge of the High Atlas Mountain, has been featured in many films, mostly as a replacement for Jerusalem. It has appeared in more than 10 movies, including Lawrence of Arabia and Gladiator. We took a walk through the city and I felt like the time has stopped there. There are many small shops where you can buy different souvenirs or take the hike to the wall. 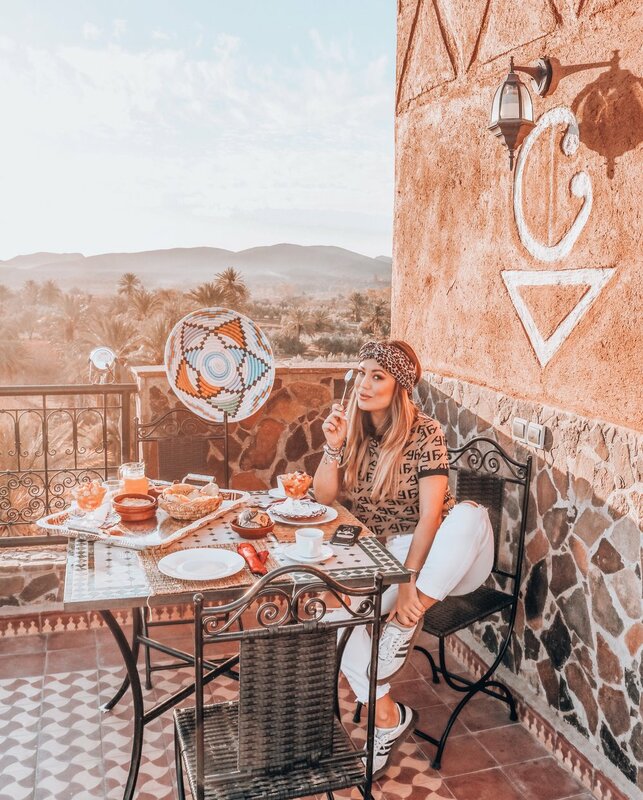 We decided to spend a night in Ouarzazate in a very cute Moroccan hotel Riad Chay . Ouarzazate is situated at an elevation of 1,135 metres. Its name comes from a Berber phrase meaning "without noise" or "without confusion". It has the best location, because of all the near by attractions. 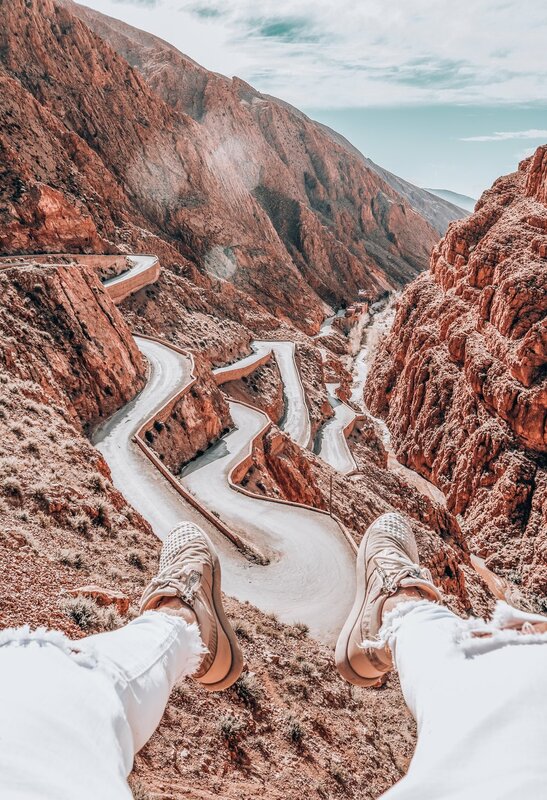 Since I am more a beautiful views seeker and nature amazed person I have left the city early in the morning and decided to go and see the view of the most curvy and funny road Dades Gorges. Second day we have left early in the morning on our way to Dades Gorges, the curviest crazy road you can find in Morocco. Starting from Ouarzazate you will pass a lot of interesting looking villages and crazy rock formations called “monkey fingers” (first picture on the left). It will take you quite some time to get to the top but at the end the view is completely worth it. For the best view point you should visit restaurant called 'Timzzillite Chez Mohamed'. From that stop it’s quite easy to go to the next amazing spot (approx. 1,5h driving) - Tinghir, where you can find one of the most amazing canyons in the World Todra Gorge. 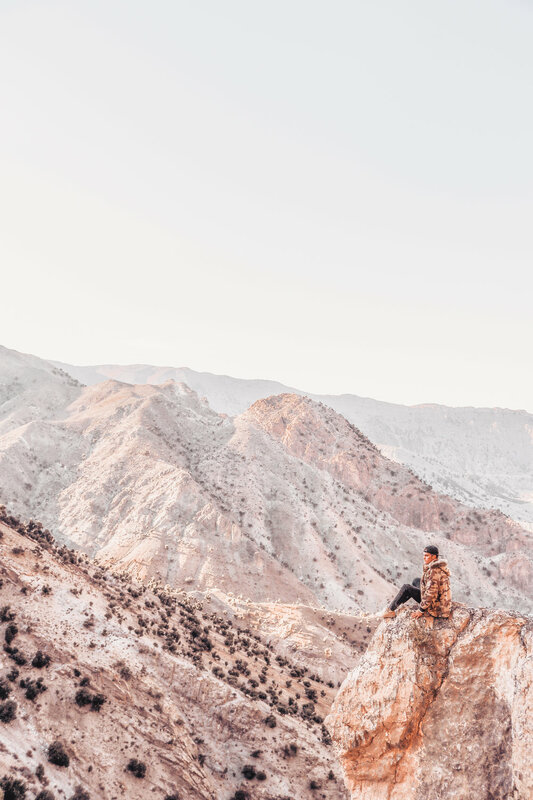 Todra Gorge is located in the eastern part of the Atlas Mountains, where the Todra River and the Dades River have carved out a narrow canyon called Todra Gorge. You can take a 14km long hike back to the city Tinghir. Nature is amazing and it will take you 3-4 hours. Since we were already late to meet our tour guide in Zagora we had to leave just right after seeing Dades Gorges. My suggestion for you would be to continue your way to Todra Gorge and do both in the same day. Let me just give you a reminder that roads are pretty tricky and difficult, for that reason it will take quite some time to get from one point to another even if they are very close. Take your time and explore all the beauty of this area, I can say this was one of my favorite experiences in Morocco. We continued our road to Zagora, where we have organized tour with tourist agency called Morocco with locals . Zagora is a common pitstop on the way to the Sahara Desert. It is the last big town you’ll see on your way to Sirocco luxury camp in Merzouga. Although most travellers won’t spend more than a night in the Zagora oasis, it’s a destination in its own right. With few signs of modernization, it’s a great place to experience traditional Moroccan life in outstanding scenery among some incredibly unique sites. There are two desert spots, quite far from each other: Merzouga and Zagora. Since most trips start in Marrakesh, you need to keep in mind that getting to any desert spot in Morocco will take you a long time. And by that I mean REALLY A LONG TIME. Zagora is a desert in the southern part of Morocco. It’s a dry stone desert so don’t expect any magnificent sand dunes. There are many different camps in Zagora desert and it is up to you which one you choose. I loved agency Morocco with locals . Everything was arranged and well organized. We took the camel ride to the camp, which takes around an hour and a half - make sure you are wearing proper clothes, because desert can be pretty cold as soon as the sun goes down, especially in January which is the coldest month in Morocco. Our luggage was waiting for us in the tent when we arrived after finished the camel ride through the desert. That was very practical, since some agencies don’t provide that option. I loved the peace in the desert, there was a spot to observe the stars in the sky. Enjoy the singing by the bonfire with the locals and wake up to the most amazing sunrise! Like I said, nights in the desert can be pretty cold, so make sure you have enough of warm clothes. Differences in temperature are huge between day and night and I was freezing when the sun went down. - To be honest I get easily cold. I must say people in the camp were very helpful and lend me some heaters which helped me a lot. Other important thing is - if you are a vegetarian - make a notice about that, because food in the desert is prepared in advance. One more thing, if you are renting a car don’t try to drive with this car right into the desert, only if you have 4x4 car than you are good to go. In any other case, leave your car in the parking lot, not to get stuck in the sand. While driving from one desert to another you will pass a lot of beautiful faunas, views and rock formations. Early in the morning we left our camp and went to Merzouga, part of Sahara desert in Morocco. If you think of a sandy desert, Merzouga area is the answer. Most desert camps in Merzouga are luxury camps. Each private tent had its own bathroom, with a fully working shower (in the desert) and electric fan. We were staying in Sirocco Luxury camp and It was a great choice. That was my biggest wish since I was a child, to visit Sahara desert, ride camels and just enjoy the sand. I can say it was magical, even though it was pretty cold since January is the coldest month in Morocco. Sand color is orange, sometimes it looks like pure gold, mixed with bronze, my eyes were in heaven. Camp was really cosy and well equipped, we had hot water, carpets all around not to get your feet too cold, a lot of different options for dinner and breakfast (even for vegetarians), great talk by the fire and amazing sunset and sunrise. We woke up early to experience sand snowboarding. After spending a night in the desert we went back to the city riding camels. I have really enjoyed my time while riding, the views were really stunning, it felt like the time has stopped. If you arrive in the camp on a camel, there is a possibility that you will need to bring all your belongings with you - YES by that I mean while you are on a camel. Hopefully you do have a backpack to make it easier for yourself. Wear natural materials, it is better for the heat or for cold. This was the most interesting part of the trip. Nature was changing so fast and somehow I had a feeling like I am in a movie while passing all the villages- some made out of mud. The 4th day we did a 9 hour trip to Bin El Ouidane. We had a stop in Tinghir, which would be smarter to make on the 2nd day of our trip (scroll up) but we were in a hurry, so we complicated our trip a little bit.. Lesson learned, don’t try to do too much in one day and just take it easy. I haven’t written much about gasoline in Morocco. It wasn’t hard to find gas stations, especially on the first part of our trip, starting in Marrakech heading to Merzouga. Just be careful about the gas when driving through Atlas mountains. We almost ran out! Then at some point we were passing one small village and noticed a sign “gas” written in french, just in front of one house that I would never guess it’s a place where you can buy gasoline. We were so happy about it! It seemed like nobody lives in that part of the country. Pay attention while driving for the hand written signs, it can help you a lot! Be prepared that gas will cost you more than on the regular gas stations. Be prepared to stay out of service on your phone. If you are navigating yourself through your phone it can be a bit tricky if you miss the road but don’t panic, there are the good old signs that can help you out. It was pretty late when we’ve reached our destination Widiane resort. In the morning I was mesmerized by the view. In Bin el Ouidane dam is a lake, seen straight from the balcony in the heart of Middle Atlas. This location was just perfect specially if you enjoy water activities, hiking or even if you wish to visit Ouzoud waterfall. We have chosen the last option. This spot can be reached easily from Marrakech as well, but we were coming from the opposite side. Be prepared to walk the stairs, that’s the first thing to know about it. There are approx. 600 stairs to the bottom and than you need to walk them up again. In the morning, when we arrived was pretty slippery, so be careful. Make sure you have the right foot wear. On the way down there are many many shops and food spots. While walking down locals will try to sell you all the possible souvenirs, luckily early in the morning half of the stores were closed. I prefer not to be bothered while doing my sightseeing. When parking your car, expect locals to occupy you and try to sell you day trips etc.. if you ask me - you don’t need anyone to take you around, especially if you have your own car. You will need to pay some fees for the parking as well, approx. 100 dirhams. You can make this excursion as a 4 hour trip or an hour, it all depends from how many different angles you want to see the waterfall and if you are up for some activities on the river. For me it was enough to just have a look at this amazing natural formation. Waterfalls were our last stop before heading back to Marrakech again, click here to check how I’ve spent my days over there (coming soon). You can follow our road or not but I am pretty sure you can find some good ideas here.